What is that I hear? The Twilight Zone theme song? Why--that could only mean one thing! Yes, faithful readers, I actually liked Dead as a Doornail. From my initial hate of all things Sookie (read my earlier reviews), Charlaine Harris has won me over. Who'da thunk it? I should probably go check my car for gremlins now. There are still lingering issues: too much mundane detail (although it's getting better), still too much exposition (ditto), the unquestioned acceptance of an Italian character nicknamed Dago (WTF?) I also find that the mysteries (including the ones in this book) are resolved far too quickly and easily. I don't know--I'm not a mystery reader--maybe that's how they all are (but if that's the case, why would anyone read them?) There's also the return of Sookie's Barbie smile (wide and fake). Ugh. Luckily this time around there's plenty to help overcome all that. While someone is going around shooting (and killing) weres and shifters in and around Bon Temps, Sookie finds herself caught in the middle of Shreveport were politics. Not only that but private investigators are looking into Debbie Pelt's disappearance and they know way too much about Sookie. But at least she has the company and protection of Charles Twining, a vampire pirate, brought in to Merlotte's to take over as bartender after Sam is hurt. Even under his watchful eye, Sookie ends up being shot at, caught in a fire, and threatened by more than one vampire. At least she can't say her life is boring. This is the first Sookie Stackhouse book I've actually found compelling. I'd have a list of things that needed doing (work, housecleaning, packing for a trip...) and instead I would sit and read a chapter. I wanted to know what would happen next and there was *gasp* tension! And when it was over, I was disappointed that there wasn't more to read. Add a big checkmark to the plus column. I like that Jason is now a were (although not full-blooded) and that we learn a lot more about the weres and their world. I thought the final fight between Alcide's dad and Patrick was well-done. And I really like that events in this book are setting things up for long-term consequences. Sookie had better prepare herself because it looks like she's in for some serious were trouble. Although I find it a little excessive, I also appreciate Sookie's promiscuity because it's not only rare in the genre, but it makes Sookie more interesting as a character and injects a bit of open-mindedness into what occasionally seems like a backward outlook in the books. I'm enjoying the vampires more and more. Something about Eric really draws you in. Bill too. Although Dead as a Doornail needed a lot more of both of them, and a lot less of Bill's new girlfriend. Not only is it too soon for him to be dating (even if it is in large part to make Sookie jealous) but moving on as easily as he has diminishes what he had with Sookie, and since that wasn't much to begin with, diminishing it even further pretty much erases it. Besides, isn't Sookie supposed to be special? Bill moving on diminishes that too. As far as other supernatural creatures go, I like Claudine the fairy quite a bit, although I have a feeling I'm not going to be a fan of the fae mythology once it's fully revealed. From what I've picked up so far, the fairies in the Bon Temps universe seem to be more akin to angels and demons than true fae. Hope I'm wrong. Did I mention the vampire pirate, Charles Twining? It seems a pretty good bet that Charlaine Harris will keep writing Sookie Stackhouse books until people stop reading them. As long as the books keep improving I don't see anything at all wrong with that. Appearance: Very pale humans with long fangs that extend or retract at will (or when a vampire gets excited). Some vampires have glowing eyes. Vamps also have glowing skin, which apparently only Sookie can see. Also, whatever physical characteristics a person has when turned remain after they become a vampire (e.g., hair doesn't get longer, a missing eye doesn't grow back). Strengths: Ability to move silently. Super strength, speed. Weaknesses: Sunlight, silver, fire, garlic, stakes. Mythology: When a vampire's maker calls them they must go to them (they can try to resist but it never lasts). A vampire cannot hunt in another Sheriff's area without getting permission, and they also have to adhere to a certain code of behaviour or else risk consequences. Vampires need verbal permission to enter a private residence, and if the invitation is rescinded, the vampire is compelled to leave immediately. [Eric] bent and kissed me [Sookie] on my mouth, as softly as a butterfly's fluttering. "You said I told you you were the best I'd ever had," he said. "But did you respond in kind?" "Don't you wish you knew?" I said, and went back to work. He had a head full of long, intensely curly hair, chestnut brown in color...He also sported a mustache and a Vandyke. Covering his left eye was a black eye patch...and he was wearing a black poet shirt and black pants and high black boots. All he needed was a bandanna tied around his head and a pistol. "Maybe a parrot on your shoulder?" I said. "Aaargh, dear lady, you are not the first to suggest such a thing...But I understand there are health department regulations against having an uncaged bird in an establishment serving drinks." He bowed to me as deeply as the narrow area behind the bar permitted. "May I get you a drink and have the honor of your name?" 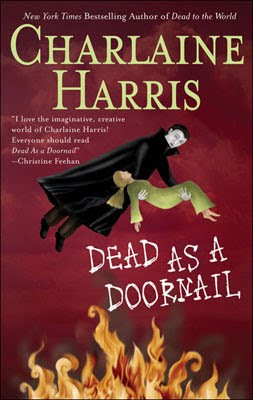 Dead as a Doornail by Charlaine Harris. From Penguin (Ace Books).